La Flecha Fugaz def Viking Warrior. Seville The Thrill, Richie Slade, Jeremy Jaeger, The Von Dooms along with Andy Brown went through an exciting all out match ending on a No Contest due to referee loosing control of the match. 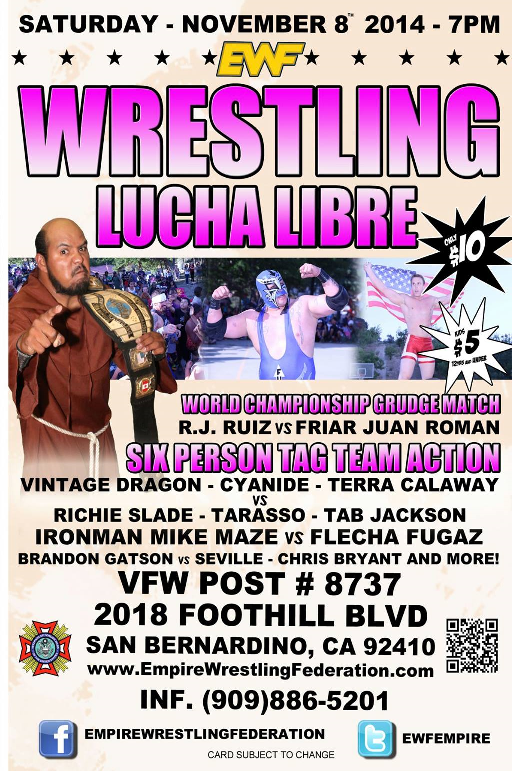 “Ironman” Mike Maze def EWF Heavyweight Champion Friar Juan Roman in a non Title match. 1 Comment on "[RESULTS] EWF on Nov 8th 2014"
LOL! I hope the card won’t change after the event has taken place.